I am a collage artist. I work with found materials. My art deals with the aesthetics of womanhood and the African American experience in the United States. As a writer, poet, and collage artist each of these talents exists within my work. I tend to use color schemes, photography, printed text, and patterns in my collages. Each piece of artwork represents a statement on culture, politics, history, and feminism. Through this form of art, I am able to express a moment in which I have witnessed or experienced. My method is consistent, using found materials, I am able to produce different visual depictions through a technique of creating abstract shaping’s of images and words. Artistically, I study the work of Romare Bearden. 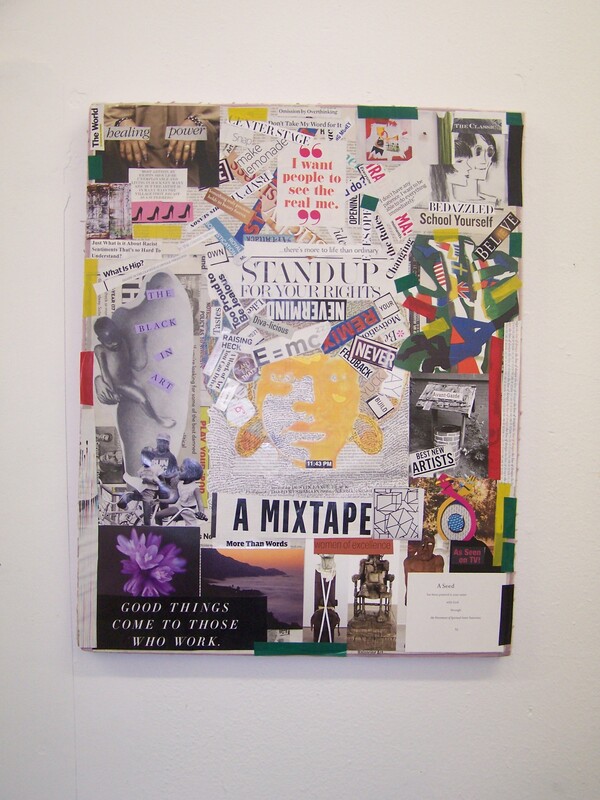 I’m intrigued by his method of using found materials and the messages within his collages. I was introduced to his work by a good friend. Since that time, I have researched and studied his growth as an artist and writer. I admire the painting technique and cultural relevance in Jacob Lawrence’s work. Above all, I am in love with the tenacity and endurance of Elizabeth Catlett. I would like to master creating art regardless of any situation just as these artists.